If you’re in the middle of a property damage insurance settlement and you want to determine the true extent and liability of the damages, a public adjuster will get that taken care of the appraising and negotiating the claim for you. Other adjusters work for the insurance company – which typically pushes the claim in their favor, not yours, we work for you! We do not work for the insurance company – we work for you, the policy holder, to get you what you deserve. 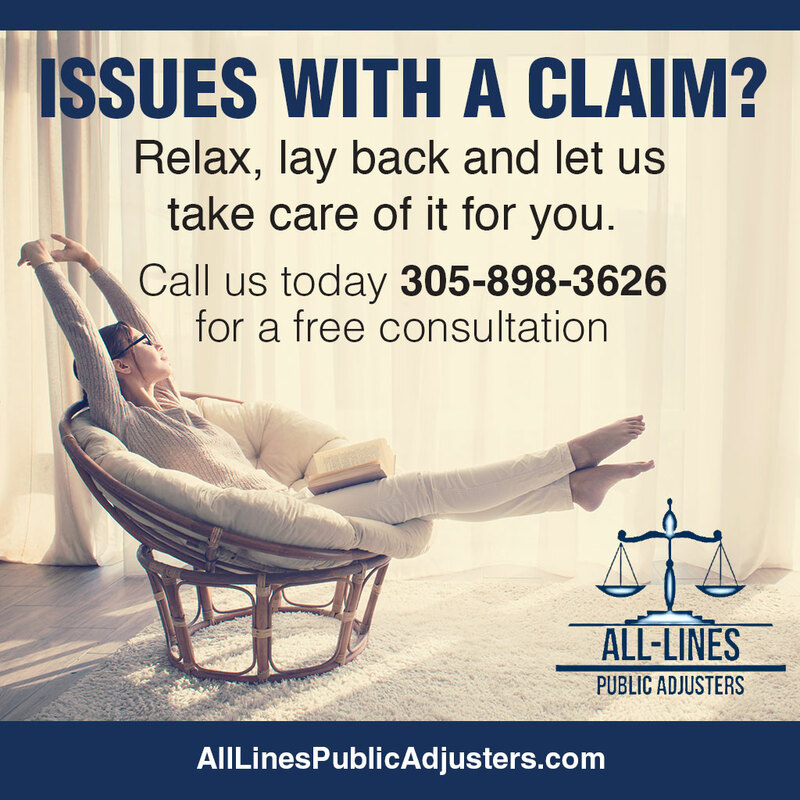 Whether you are a business owner with a commercial claim, or a homeowner looking to settle a residential claim, All-Lines Public Adjusters will get you the proper settlement in order to get your property back to its original condition. We understand that dealing with water, flood, fire, and windstorm damage can cause distress on your life and schedule – and that is why you need a public adjuster to assist you in properly evaluating your insured loss. Q: Why work with a Public Adjuster? A: The insurance companies have experts on their side – so should you. A survey by the State of Florida found that there was a 747 percent increase when an adjuster was hired at the start of the claims process. Q: What does a Public Adjuster do? Our vast knowledge and years of experience in preparing, presenting, and negotiating property damage claims has proven to produce the most favorable insurance settlements for our clients in the Miami and surrounding areas. Don’t let the insurance company take charge of your claim. Call us first. Regardless of whether your claim has already been closed or paid – or even if it’s been denied – we can still reopen and review it, possibly changing the outcome for the better. Because we work only on a contingency basis, we only collect if you do. A public adjuster is an insurance professional who represents the interests of the policyholder in settling a property insurance claim. Public adjusters, such as those from All-Lines Public Adjusters, have special training and expertise in appraising, preparing and negotiating property damage and business interruption losses. Types of disasters from which they help policyholders recover include fire, windstorm, flood, hail, earthquake, structural collapse and more. Most public adjusters are paid based on a small percentage of the total settlement. Such is normally the case with All-Lines Public Adjusters, whose fee is minimal in relation to the ultimate claim settlement. In the vast majority of cases, the difference our public adjusting services make in the amount of the claim settlement the policyholder receives more than offsets the fee. How Else Does a Public Adjuster Make a Difference? Following a disaster, filing and pursuing a complicated insurance claim is one of many monumental tasks a business or homeowner faces—and it is a process with which most are unfamiliar. On the other side of the fence sits the insurance company, with experts who adjust claims daily and who are always watching out for the company’s interests.